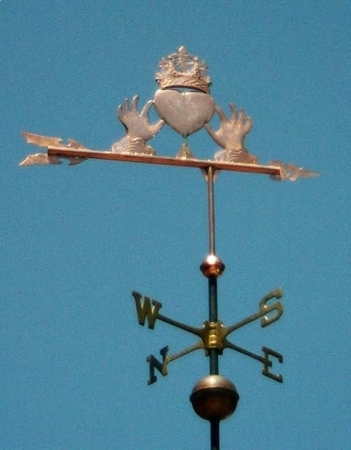 Our Claddagh Weathervane is a stylized representation of the Claddagh, which were finger rings where the band becomes hands clutching a crowned heart. Claddagh first became popularized in Ireland in the 17th Century and today are often selected as rings of courtship and betrothal. In the Claddagh design the heart represents love, the hands are of friendship, and the crown is loyalty. It is a sweet design and tradition, and we think created a wonderful weathervane for a family home. This sculpture piece is fabricated in swell-bodied style from copper sheet, and the crown has light catching glass jewels. As pictured here our customers requested optional gold leaf on the heart, hands and cuffs with details on the crown, and the custom arrow and fletching. The areas gilded with precious metals will remain bright highlights as the copper weathers. These customers also asked us to inscribe their family name onto the bar of the arrow, and had us seal into the heart ‘lucky pennies’ from the birth years of their lineage beginning in 1929. What a sweet family heirloom. 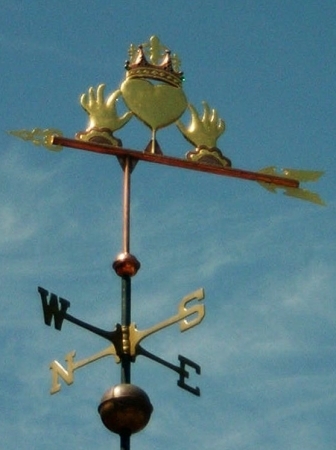 Many of our weathervanes can be simplified to fit a budget. This piece would also be splendid without the gilding, and could be personalized to a silhouette style in the smaller sizes. All of our weather vanes are custom made. We are here to discuss getting you the vane you want.